FuseFX WS-Series Matting Powder is a unique blend of water base matting agents designed to eliminate the shine off of silicone painted surfaces, giving it a flat matt finish with little to no sheen. 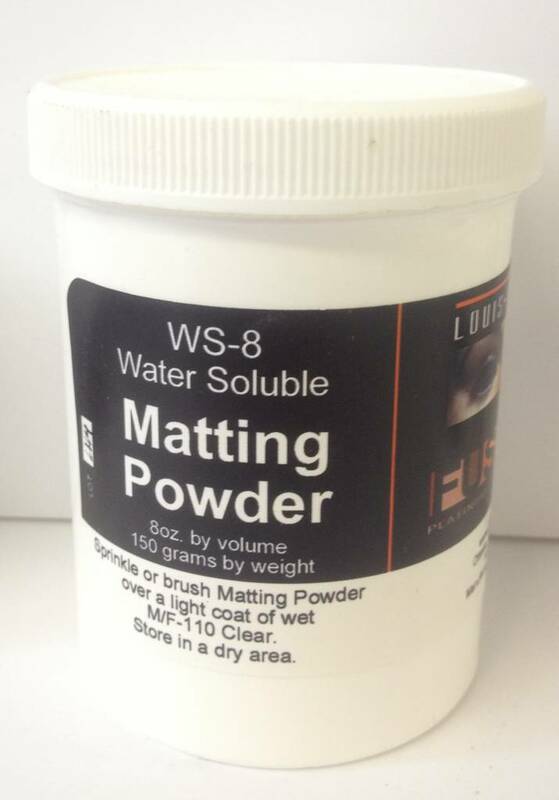 FuseFX WS-Series Matting Powders must be used with M/F-110 Clear and both should be catalysed together for best results. 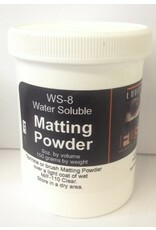 FuseFX WS-Series Matting Powders contains NO Amorphous Silica and NO Cabosil. Please use an appropriate dust mask when using this product. How to use: After completing the final coat, touch-ups or airbrushed painting, apply a thin coat of M/F-110 Clear and let cure or force dry with a hair dryer. Apply a second coat of M/F-110 Clear, this time very lightly, just enough to Ã¯Â¿Â½Ã¯Â¿Â½Ã¯Â¿Â½wetÃ¯Â¿Â½Ã›Â the surface. Go over the surface with a Ã¯Â¿Â½Ã¯Â¿Â½Ã¯Â¿Â½dryÃ¯Â¿Â½Ã›Â brush or a tissue paper to pick up any extra blobs of paint making the surface even. The surface must be just moist otherwise it will leave little specks of white powder. In this case you can touch it up the white spots by carefully scrapping off or touching up with a little color. While the M/F-110 Clear is still moist, loosely apply the FuseFX Matting Powder by sprinkling or using a dry Ã¯Â¿Â½Ã¯Â¿Â½Ã¯Â¿Â½fluffÃ¯Â¿Â½Ã›Â brush stippling/pressing the Matting powder onto the surface as you go, do not rub. A small Make-up Artist Ã¯Â¿Â½Ã¯Â¿Â½Ã¯Â¿Â½Blush BrushÃ¯Â¿Â½Ã›Â works great. You donÃ¯Â¿Â½Ã›Âªt have to apply lots of powder just a little stippling to cover the surface, a little goes a long way. If you're starting to get a build-up of Matting powder on the tip of your Fluff Brush, then your surface is still too wet. You can quickly absorb some of the M/F-110 Clear with a paper tissue to remove some of the excess. You can also wash down the surface with solvents to remove the still wet M/F-110 Clear and Matting powder and start over again. This can only be done before the surface starts to cure. Once the surface is fully covered, use a hair dryer to force catalyzed the Clear and Powder together for MINIMUM of 3 to 5 minutes or let cure for about 3 hours. You may also place the powdered piece IN A WARM OVER ONLY. Too hot may cause the powder to crystallize, creating an uneven surface. Once cured, you can wash the prosthesis under warm to hot water and a little soap, pat dry or blow air to dry the surface. Your piece is now ready. If you missed any spots, simply apply a thin coat of M/F-110 Clear to the shiny areas and add a little FuseFX Matting Powder. Again, use a hair dryer to force catalyzed the Clear and Powder together for MINIMUM of 3 to 5 minutes. Once cured, you can wash the prosthesis under warm to hot water and a little soap and pat dry. You can always add a little sheen back to your already matt surface by stippling a light thin coat of M/F-110 Clear.